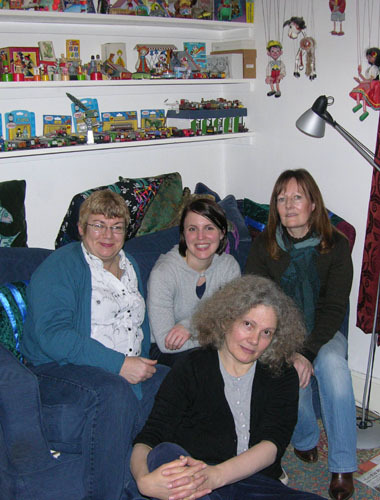 Cally Trench, Imogen Welch, Frances Greenough and Linda Francis met at Cally's house to discuss work and projects on 30th December 2010. We looked at the drawings, paintings and collages that Cally and Frances have made as part of their Wednesday, Friday, Saturday project. We discussed Linda's ideas for a new Remarkable project relating to the incidental marks that we all make over time on objects and places. We heard about Imogen's plans for more work on The Shredded Money Project, and we looked at Cally's Teatime pop-up book.